There are a few points to consider. First, we must be practical. If for some reason the 16' door does not open (i.e. : mechanical failure), you understand that both vehicles will be stuck inside the garage. To be in that kind of predicament with two single doors is almost impossible. You will at least be able to have access to one of the vehicles. Another thing to consider is If you live where the climate tends to get pretty cold, opening a double door will let more cold air in than opening a single one, thus dropping the temperature of your garage faster. Finally, the last point would have to do with design and taste . 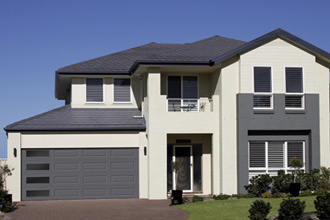 When you have a double garage door and it is on the front of the house, it becomes very much part of the style setting of your house. 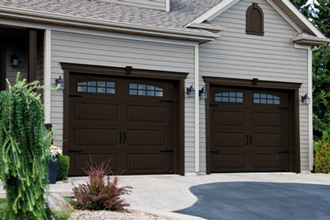 A lot of people don't like to bring so much attention to their garage door. For them, it is preferable to install two single doors instead. This way you can maintain a good balance between the doors and the rest of the house. For them, it is preferable to install two single doors instead. This way you can maintain a good balance between the doors and the rest of the house. Will there be any extra cost? No, not as such. The price for two single doors is about the same price as for a double door. The difference would come from electrically operating the two single doors. Get a free quote!